The Detroit Tigers signaled the beginning of the rebuilding process with the trades of JD Martinez, Justin Wilson and Alex Avila, and Justin Upton this summer. But, the trade of Justin Verlander signaled the end of an era. Since his AL Rookie of the Year season in 2006, Justin Verlander (JV) had been the face of the Tigers franchise. Even before Miguel Cabrera arrived in Detroit, JV had already racked up 35 wins, 314 Strikeouts, an All-Star appearance and an AL Pennant. For over a decade, Verlander has been among MLB’s elite arms. Tigers fans will never forget his dominant performances on the mound. 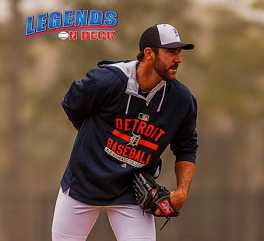 From his ROY season to his 2007 and 2011 No-Hitters, his 2011 AL Cy Young and MVP awards, a second AL Pennant in 2012, to his should have been Cy Young season in 2016; JV’s career achievements in Detroit was cemented in Tigers baseball history. Outside of Clayton Kershaw, Verlander is arguably the best Pitcher, consistently, over the course of the last decade. And in an era where baseball has had few celebrities, JV’s long term relationship with supermodel fiancee Kate Upton projected his star power beyond of the game. Tigers fans often had fun with their relationship, speculating whether or not their ups and downs impacted his performance on the mound. As one writer put it, “he let us know him.” In the past decade, Verlander was not just the face of the Tigers, but the face of Detroit sports. Since being traded to Houston on August 1, he is 5-0 with a 1.06 ERA, 0.65 WHIP and 43 Strikeouts. This will be his eighth season amounting over 200 Strikeouts. The Verlander-Keuchel duo is perhaps the strongest pitching combo of any team entering the Postseason. Throw in the potential AL MVP season of Jose Altuve and a MLB leading .282 team Batting Average and the Astros look like a serious contender this October. At the age of 34, it is entirely possible that JV has at least a few more great seasons left in him. By the end of next season, he should surpass his 200th career Win. Hypothetically, if he had just four more seasons at an average of 15 Wins and 150 Strikeouts, he would pass recent Hall of Famers Pedro Martinez and John Smoltz in Wins and place right near them both in Strikeouts. The key for Verlander, in terms of a chance at Cooperstown, is keeping his career ERA (currently 3.46) in check. A World Series ring would sure help his case too. If Tigers fans want to see the former franchise Pitcher granted a shot at baseball immortality, they would root for his success in Houston this postseason and beyond. Go Astros!